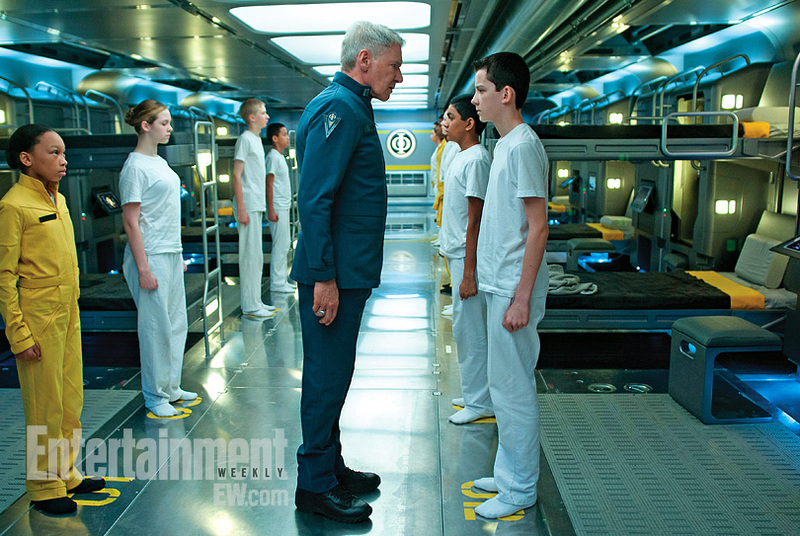 If you see a website, magazine article, television story or other media that references either the Ender's Game film, or any interesting information about its cast or crew members, please use this thread to link it up, and to make the rest of us aware of it! Watch this space. Word on the street is there will be something fun and interesting to see tomorrow morning. "After two alien attacks all but wipe out the human race, a new world order trains children to lead the survivors against aliens. ~ Baseline StudioSystems"
That's all I can find...for now. Woo, that would be a welcome change! And apparently I live on the wrong street. Word from that street is that we should be seeing that fun something between now and 10:00 EST. So stay tuned. I love how tall Asa is. I see far too many straight lines receding off into the distance....shouldn't the floor (and also the ceiling) curve up? Maybe their barracks go from top to bottom instead of around the curve of the loop. I assume you mean "Run parallel to the axis of rotation of the Battle School Habitation Ring" as opposed to "run along the perimeter of the Habitation Ring"
Title: if ever a wizz there was? It's been a while since I've read the book carefully, but I always had the impression that the curvature was slight enough it was only noticeable in the long hallways. I love the picture, though, it looks great! wheel of the Battle School. Interesting. But they call him "Wiggin Ender"
Boothby wrote: Interesting. But they call him "Wiggin Ender"
An article on Tuesday about the heiress Gigi Pritzker and “Ender’s Game,” produced by her studio, OddLot Entertainment, misstated the name of the protagonist in the Orson Scott Card novel that the film is based on. He is Andrew Wiggin, known as Ender; his name is not Wiggin Ender. Did anyone but me (and Darian, and maybe Noah) notice the fascinating article on ENDERNEWS.COM yesterday, that showed some pre-production artwork from two of the designers? Darian had found the artwork, on publicly available sites, and EN had posted the images and links, and some discussion. I was definitely excited by the details that were shown, and since Darian had figured out the first half, I went ahead and figured out the second half. Well, it's all gone now. I was quite excited to see the photos of the interior of the Battle School, as well as some architectural models of the interior of Eros and the Simulator stations. But they're gone now. Is this how a film production treats its fans? IDK...maybe it is.